The University of Georgia College of Engineering invites you to commit to a new generation of engineers through our alumni + student engagement programs. Spend an afternoon in Athens and share your wisdom with College of Engineering students! Your participation as Alum of the Day allows students the opportunity to make a meaningful alumni connection while meeting two-on-one in a conference room setting. There is minimal prep work to be done on your end; a meeting schedule and resumes will be provided in advance for review. There are no better candidates to facilitate conversations around industry know-how and life after college than our very own Bulldog Engineers. Would you enjoy interacting with young adults in a closely held, roundtable discussion? Alumni and Friends of the College of Engineering are invited to participate in our Day in the Life Series and educate students about career options by connecting classroom learning to real world situations. These sessions are an hour in length and are designed to be instructive and engaging. We invite interested alumni to walk students through a typical work day and/or engage them in current projects. Looking for an informal way to give back? 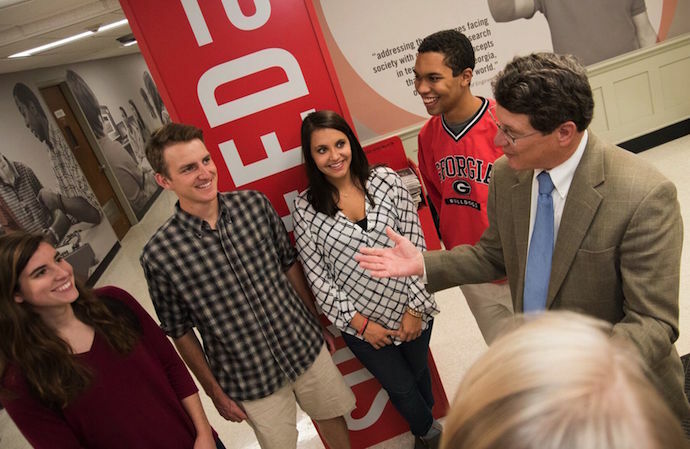 Interested in keeping a finger on the pulse of the growing UGA College of Engineering? The Alumni Mentor Program serves as a platform to help prepare students for a successful future and leave a permanent, positive impact on the campus community. Mentor Applications are now being accepted. For more information about alumni and student engagement opportunities, contact Kim Brown at kimberly.brown2@uga.edu.